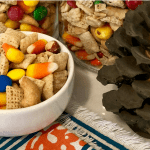 Grab a bowl and make this yummy Scarecrow Snack Mix Recipe for your family. We love the new Vanilla Gluten Free Chex cereal! But please, use your favorite. Store in airtight containers. We love using Ball Mason Jars! If your kids or teens are taking the snack mix to school and are concerned with peanut allergies. Leave out the peanuts and add kid safe replacements. I am pretty sure the kids would not turn down an extra cup of chocolates!